That's it....I couldn't take it anymore. I desperately miss my locs. Yes, that first set had to go, and I'd had all intentions to "enjoy" my un-loc'd hair... the curls, the two-strand twists, the afro puffs. But I've come to the conclusion that I hate doing my hair every morning locs are just more.... Me. I went to a new loctician/natural hair stylist this time named Eboni. For reasons I'm not going to go into here, going to my old stylist just wasn't in the stars (but mainly because he never responded to my messages). It's cool because it fits with this whole notion of "change" and I'd seen Eboni's work on one of my good friends, plus she did my daughter's locs (my stylist wouldn't do kids' hair). I had her start them smaller this time and she did them perfectly... the size seems to conform much better to my natural curl pattern and (so far) seems to stay better. I'm still taken aback from time to time when I catch a glimpse of myself in the mirror because it's just so short.... the shortest it's been in over a decade. But.... oh well. It's hair. It'll grow back. 1) You don't have to "do" anything to locs to create them. One of the most common questions I used to get was "how do you get your hair to do that??" The simple answer is... nothing. Locking is a completely natural process in which the curls of the hair intertwine with each other over time to form locs. If all you did was simply quit combing your hair, you would eventually end up with locs (albeit rather lumpy and uneven locs, better known as "freeform" locs). Yes, I go to a loctician for the initial twisting to form the base pattern for the locs, but after that it's all about time and proper care. Retwisting and palm rolling are grooming techniques, NOT locking techniques. You may do a search for locking techniques and come across sites that talk about backcombing and such.... this is NOT for black hair. Locs on caucasian hair (or any other extremely fine hair texture) is a totally different thing. Black hair locs on its own. 2) People with "good hair" have locs, too. In the month since I took my locs down, I've been telling people that I eventually planned to start another set. The response across the board has been "Whyyyy?? Your hair is so PRETTY!" or, the response that makes me cringe, "Girl, you've got that 'good hair' why would you want to loc it?" (the term "good hair" makes me see red). When I went to my appointment, Eboni tried to talk me out of starting my locs, even jokingly refusing to twist my hair. Yes, coarser hair textures tend to loc easier.... in fact, that's the main reason I started my daughter's locs, because combing her hair was torture (for us both). But locs aren't just a last resort for those who are happy to be extra nappy. But "good hair" will loc, too. It may take a little more patience, but that aspect actually appeals to me. Everything worth having is worth working and waiting for. 3) Locs can (and should) be washed..... but just not at first. This is my least favorite part of the locking process. I'm used to washing my hair at least every 3 or 4 days. Eboni said not to wash my hair for the next 2 MONTHS, meaning basically I can't wash my hair until 2010. Not to get all Mr. Wizard on you, but water breaks the molecular bonds between strands of hair. This is why curls (and presses) die in humidity and rain. When locking, you want those strands of hair to stay as close and intimate as possible until they start to intertwine and tangle together. Before you say "ewwwwwww!" let me stress that not washing does not mean not cleaning. During those initial few weeks (and in between periodic washings) the scalp should be thoroughly cleaned with an astringent like SeaBreeze. 4) When it comes to products, more is less. You don't need any products to form locs. It's very common for new loc-ees to get excited and join all kinds of forums where people are telling you to try this product and that product, and before you know it you're a product junkie. People will espouse to using bees wax or pomades or gels that are supposedly designed to form locs.... wholly unnecessary. Not only will this stuff build up in your locs, but it also attracts dirt. Think about what happens when you spill something sticky on the floor and don't clean it up all the way. You know how that spot gets dirtier than the rest of the floor? Yea, same concept. This was one big eff up that I made with my first set of locs. I used way too much Organic Root Stimulator Loc 'n Twist gel, noticed it was building up, then tried a regimen to remove the buildup. Well, in the process I basically removed the budding locs.... or rather, the buds (the part that starts to tangle) came unraveled and slid down the locs, making them lumpy and uneven. Eventually they looked ok, but my hair never really recovered from that initial screw up and they were always lumpy in some places. Basically all you need is a light oil (shea butter or olive oil based oils are good, as well as a few others), water and some setting lotion. The only product I might recommend is the ORS Loc 'n Twist gel, but even this should be used very sparingly. Run your finger over the surface of the gel to put just a thin coating on your fingertip. 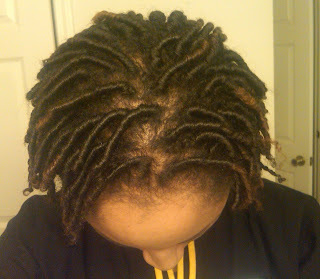 Again, I will stress.... locs form on their own. The products do NOT form the locs, just groom them. 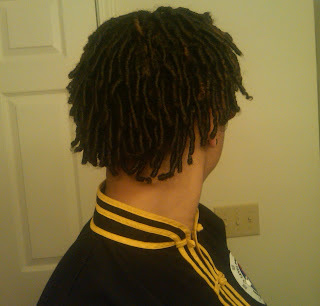 5) The main key to locs is patience. There is no way to speed up the locking process. It's all about time. It takes at least 9 months to a year for locs to form, and even after that they continue to mature and firm up. The locking process starts about an inch or two from the root with "budding". Small masses of tangled hair start to form that look like... well.... buds (yes, those types of buds). These buds continue to extend down the loc as the hair further intertwines and the locs mature. If you want to read about the 5 stages of locking, you can find a good blog post here. For me, locs are a labor of love, and it's something that many people admire but few have the patience to actually do. So there it is. I'll keep you periodically posted and updated on the progress (for anyone who's ever wanted to know how all this works). With my first set of locs I had a whole blog dedicated to my loc journey. I think it's gone now, though.... it may be some poor abandoned zombie blog out there in the blogosphere. Hallelujah! Why am only reading this entry now? Tip 3 is EXACTLY what I was confused about. The opinion that locs can be washed early was what steered me wrong. Your statement that "locs can (and should) be wash but not at first" is totally what I was missing when I researched all those month ago. Like you I was used to washing every few days but was convinced locs would just happen regardless. Mentioning how curls and presses are broken down by moisture is g-e-n-i-u-s. I finally see the light AfroD.